About Us | Otero County Electric Cooperative, Inc. The history of Otero County Electric Cooperative, Inc. (OCEC) starts in October 1939 in the Texas Hotel (which is now the antique shop). Ray Daniels, MD Brantley, LA Hendrix, CM Bell, Ora Swope, JM Walker, John Mershon, Angie Cleve and JB Runyan came together to form our first Board of Directors. Together, they instated the first by-laws and issued the first membership certificates at $5.00. Line construction started shortly thereafter. As sales increased, we expanded to Carrizozo and Alto, and as we expanded more lines were built to service new areas. New technologies were implemented to ensure affordable and reliable electricity for our customers. We currently serve 21,294 meters across 2,764 miles of line in Otero, Lincoln, Chaves and Socorro counties – as compared to just 76 miles in 1941. Our employees are here to serve you. If you have any questions on member relations, energy management, public relations, or concerns about your bill please call our offices at 1-800-548-4660. 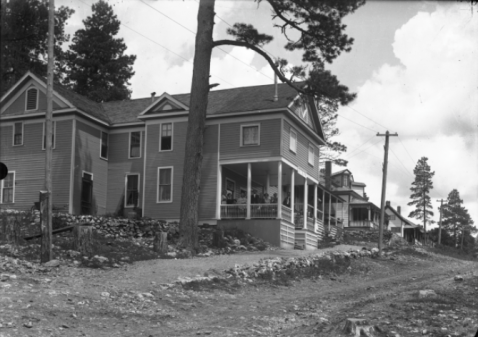 The picture to the left shows the Texas Hotel where the first meeting of the Board of Trustees took place in 1939. 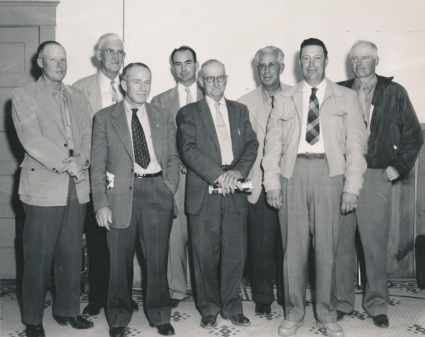 The picture to the right is of the Board of Trustees from the mid 1950's. From L to R: unknown, Roger Mayfield, Jack Vickers, Jack Hobson, W.A. Gage, unknown, George Sisneros, and J.B. Runyan.